Our NMR Facility is located in the AT&T Science Center and available to students, staff and faculty at the University of the Incarnate Word. 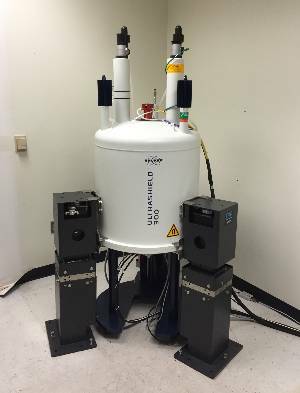 The NMR Facility includes two NMR spectrometers: a Bruker 300 MHz, and an Anasazi Eft-90. All researchers using any NMRs are charged for the use of the NMR instruments. This money will be used to cover all costs of operation including cryogens (liquid helium and nitrogen), and instrument maintenance. Accessing the NMR requires prior training and a personalized user account. Please contact Dr. Robert Garner for a training appointment.